This assignment requires students to write a children's book in the form of rhyming narrative poetry. Students always think what Dr. Seuss did was easy, but this teaches them the true skills involved! 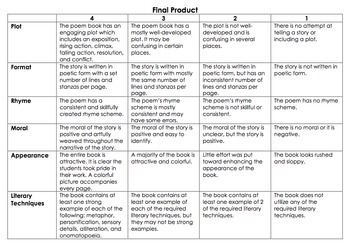 Project explanation, rubric, and planning page are included. I always end this project by selecting the 2 best books from each class and allowing their authors to go share them with local kindergarten students -- they love it!